When talking about my hobby, one thing people ask me is “How did you get into this?” – “this” being my main project, the table. There are a number of things which contributed to this, really. The most influential of these was my introduction to Nottingham Hackspace. To be honest, I would never have had the idea, let alone thought it possible, had I not had access to the wonderful community and workshop facilities. Occasionally members run “workshops” where they bring a specific skill or task to an evening or weekend and demonstrate or teach anyone who is interested. It was one such workshop, run by a chap called Martin Raynsford (msraynsford.blogspot.co.uk), which introduced me to the art of marquetry. Marquetry, for the unknowing, is a process by which pieces of veneer (thin slices of wood, usually of different colours or a particularly exotic species) are inlaid into an object, usually wood and glued into place. Martin had been using a laser cutter in order to precisely cut the veneer and inlay it into engraved pieces of wood, to great effect. The workshop involved making a simple wooden coaster and inlaying pieces of veneer cut on the laser cutter, to form an image and your name. Needless to say, the act of arranging the pieces and glueing them into place was fiddly! In the end two methods emerged – glueing a few small pieces at a time and allowing the glue to dry before continuing, or assuming the design was less complicated, arranging the pieces next to the coaster, filling the inlay with glue then quickly transferring the veneer into place. A quick dab with a piece of paper towel and pressing a clean, scrap piece of ply over the top and weighing it down was essential. This was because the veneer has a tendency to curl upwards as the water-based glue was absorbed by the dry wood. Once dry, the coaster could be sanded smooth then oiled, stained or varnished to a variety of finishes. The whole workshop took a couple of hours and my first coaster was a success, given to a friend as a house-warming present (I had personalised it with her name). 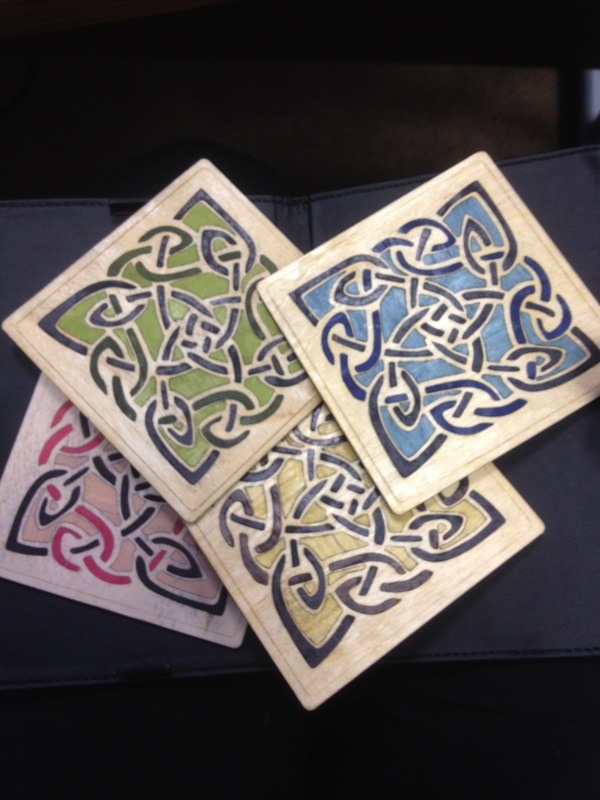 I was not satisfied with making just one coaster, so a few days later I began trawling the internet for a design I liked to make a set of my own. This was where I first began to learn how to use Inkscape. The image I chose was similar to a Celtic knot-like pattern (I have no idea if that is the correct term!). The image was imported into Inkscape. The tool “Trace bitmap” provided me with a template, albeit a complicated one, so I simplified the drawing slightly by removing lots of small sections, whilst trying to keep at least an abstract form of the original pattern. Two copies of the drawing had to be made – the shapes of each section in order to cut the veneer and block-filled sections to engrave the coaster. The latter was “mirrored” and inset, to allow for the diameter of the engraving laser beam, whilst the former was outset. This changes the drawing minutely by shrinking or expanding it half the width of the laser beam, approximately 0.15mm. If I had not done so, there would have been a gap the width of the laser beam around each piece of inlaid veneer! A couple of hours of cutting later and I was ready to begin inlaying the coaster. In the end I opted for a variety of colours of veneer – my partner had purchased a mixed pack of coloured veneers for a similar project (http://fowkc.wordpress.com/2012/09/19/fluxx-box/) and I merely “helped myself” to the leftovers. Of which there was quite a lot. This produced a variety of pleasing combinations and I now have a selection of unique coasters scattered around my living room and desk, coated with a clear varnish to protect from inevitable cup-rings. In fact, I was so pleased, I engraved my name into the back! This entry was posted in Inkscape, Laser cutting, Laser engraving, Marquetry on February 24, 2013 by mellchie.